The IITC Plantar Test and tail Flick Test Apparatus combination system all in one ; is the only commercially available system of its kind. No need to purchase two separate systems, our combinations system enables researchers to perform both tests with this unique design. Testing properties of narcotic and stronger non-narcotic drugs on unrestrained mice and rats in plantar mode. The IITC Plantar Test Analgesia Meter for paw stimulation can be used on 12 mice, 6 rats and other animals (cats, rabbits) unrestrained when testing for narcotic drugs. Experiments are easy to perform, simply slide the test head under test subject, align the heat source via our exclusive guide light (idle state) by the attached, adjustable, angled mirror on test head to test subject and perform tests. Tail Flick Test mode - the test head is attached to the electronic gear and the heat source now sits over a tail groove that has a sensor that detects the when the animal flicks it tail. System records and displays time and temperature of test. 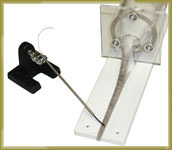 A humane cutoff timer that can be set by user, preventing tail tissue damage if test subject has not reacted within preset time. Trigger temperature is automatic at the start of every test. This optional feature allows automatic preheating of the tail. To ensure experiment protocols to be precisely controlled and repeated. This feature allows the user to SET the tail temperature at start of each test is to be started at up to 75 degrees Celsius. Once that preset temperature is reached the test and the timer starts automatically and after the tail flicks the timer and light stop and the result is displayed. Readout will now show in repeatable sequence the start and end temperatures as well as test time. 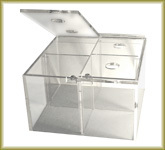 We recommend animals be restrained with one of the IITC restrainers.